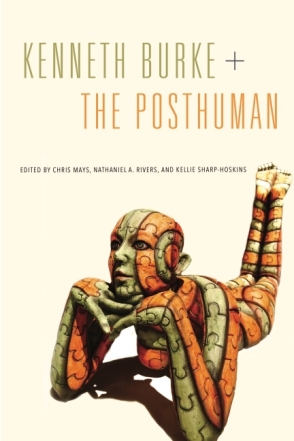 Kenneth Burke + The Posthuman, edited by Chris Mays, Nathaniel A. Rivers, and Kellie Sharp-Hoskins, is a collection of responses to the emergence of posthuman studies in an era when Burkean literary and language theory remains pervasive. As we know, there are "many Kenneth Burkes," and naturally his work requires a great amount of unpacking. That unpacking is exactly what the authors of these essays do, in the light of posthumanism and a technologically oriented future. This collection brings Burke into proximity with a number of theoretical perspectives, all voiced by scholars seeking to pull more from Burke's thought than has already been illuminated. 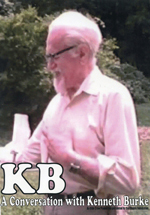 The introduction to Kenneth Burke + The Posthuman contains two points that characterize the collection effectively. First, the editors sum up the book's thesis with a statement that is supported by all of its authors: "In brief, we argue that Burke is compatible with posthumanism." Compatible is the perfect versatile term here: Burke's work is notably skeptical of a techno-future, but it also contains enough ambiguity and, quite frankly, hope, to be altered, carried into, and grafted on to posthumanism in ways that alter how we currently think about that field of inquiry. The second quote that I will highlight from this introduction is this description of a future (present) network of entities and ideas: "As Deleuze and Guattari remind us, despite its seeming table, from this multiple can always be subtracted the one; as they put it, a person must begin mapping, or must find a point at which to engage, via 'subtraction.' In short, to deal with the multiple, as we do with this project, a person has to start somewhere" (3). It is on this self-explanatory note from the authors that I launch my critical review of this fantastic collection. "Boundaries" opens with "Minding Mind: Kenneth Burke, Gregory Bateson, and Posthuman Rhetoric." In this essay Kristie Fleckenstein kicks off the book's greater conversation by diving directly into cybernetics through a comparative analysis of the work of Kenneth Burke and Gregory Bateson. She connects Burke's perch above history, which allows for his panoramic view, with Bateson's concept of "second-order cybernetics," arguing that both express the vision of monitoring complex systems in a metacognitive way. Essentially, the idea is that we are (or house) our own ways of knowing, and we are watching ourselves (27). Fleckenstein boldly ushers Burke directly into the posthuman conversation (alongside Bateson, to note), and brings Burke's sense of moral obligation along for the ride, which may be what the posthuman discourse needs most: "These, then, are the three implications of Burke's minding Mind: responsibility-with-intent, differences with a future, and a kairos of the long view" (38). Key to understanding the relationship between Burke and Bateson is their mutual understanding of difference and how it can be harvested and applied to futures. Fleckenstein highlights this facet of the Burke-Bateson conversation well, and demonstrates an understanding of how harnessing and harvesting ambiguities can serve to our betterment, illuminating a sometimes dim cyberfuture. Jeff Pruchnic recognizes the inevitability of a posthuman rhetoric, and asks ethical questions that straddle a border between What can we do? and What will we do? In "The Cyberburke Manifesto, or Two Lessons from Burke on the Rhetoric and Ethics of Posthumanism," Pruchnic quickly reminds us that Burke never forgets the self-serving quality of ethical behavior, and the mirrored self-interest that characterizes (or, essentially, is) humanism. Pruchnic suggests that if the key ethical component of posthumanism is to extend our ethical behavior to consider nonhumans as subjects deserving of ethical treatment, then we can capitalize on the self-serving quality of humanistic ethics, and carry it over into posthumanism as a pillar of a new ethics: "…a posthuman rhetorical strategy that focuses on the 'vice' in the human tendency toward perceived exceptionality or supremacy, in order to motivate more ethical action toward other humans and nonhumans, might be a far from unethical process for creating more responsible behavior in the world" (57). "Revision as Heresy: Posthuman Writing Systems and Kenneth Burke's 'Piety'" by Chris Mays is a fascinating exploration of mechanistic agency at work in the writing process. Mays asserts that each text comes equipped with its own agency, and therefore the revision process is not only much more complex than it may seem but it is also largely outside of the writer's hands, so to speak. Mays writes, "By taking seriously the notion that texts themselves have agency," his own argument "complicates commonplace notions of writing and, in particular, of revision" (61). He builds on the suggestion by Peter Elbow that a text is "in itself" oriented in a particular direction (qtd. in Mays, 61). The insertion of Elbow into this discussion is highly enlightening personally; the inquiry into agency in language and texts is not new, but it is in need of much more concentrated attention if we are to fully understand and articulate language's potential as a co-agent to the human. Mays highlights Burke's emphasis on increasingly complex systems and our involvement in them, both as movers and moved entities. The implications behind Burke's designation of piety as expression of a need for orientation expand significantly when considered in the context of complex systems theory. Utilizing Dramatism, Mays uses Burke's pentad of terms to analyze the writer and text as codependent actors working together to create meaning in a shared drama. Ultimately his point is this: "Systems [here, texts] aren't 'willed' into new configurations. They 'drift' into them" (74). What sets this essay apart from others in this collection is its insistence on carrying pentadic analysis into the posthuman conversation. The topic of the nonhuman as periphery enters the conversation with Robert Wess's essay, "Burke's Counter-Nature: Posthumanism in the Anthropocene." According to Wess, "Counter-nature may well be more important today than when Burke conceived it. Furthermore, it could become much more important in the decades ahead if posthumanists and Burkeans join together to use it to turn theorists toward Anthropocenic posthumanism" (80). He appropriately highlights critical attention beyond his own to Foucault's prediction of a coming epoch at the close of The Order of Things. Wess draws a line between posthumanism and the Anthropocene, arguing that the posthumanists can "turn to Burke" to find a bridge between posthuman and the Anthropocene, to an "Anthropocenic Posthumanism" (83). He notes, "Burke's interest in human difference is actually suited to the Anthropocenic difference that undermines the humanist difference. For Burke consistently sees that what makes us different is no reason to make us proud" (84). Wess's delineation between posthumanism and the Anthropocene is difficult to disentangle at first, but it becomes more apparent as the essay continues. Wess digs into Burke's 1983 revisions (afterwords) to Permanence and Change and Attitudes Toward History to reveal Burke's reconsideration of his own term "counter-nature," which assigns to it an "open-ended" ambivalence rooted in the Latin contra (87). The strength of Wess's argument lies in the assertion that Burke's "counter-nature" anticipated the Anthropocene, and the Anthropocene in turn influenced Burke's own revision of his term "counter-nature." This particular part of the argument is a bit windy, but I believe it is intended to demonstrate through the prose the complexity of this (post-)predicament. Wess's argument ultimately boils down to this: the ambivalence that ultimately prevails in Burke's assessment of man's future in an environment dominated by technology can be applied in the modern epoch to emphasize human awareness of our ongoing interaction with technology, and move forward with (or against) technology with a sense of both curiosity and caution. In his essay "Technique—Technology—Transcendence: Machination and Amechania in Burke, Nietzsche, and Parmenides," Thomas Rickert performs a comparative analysis of three daunting thinkers, focusing on their understandings of the relationship between technique and technology. His invocation of the Greek terms askesis, amēchania, and mêtis reminds us of the interactivity of these terms both aurally and logically (and lexically), and stakes a position similar to that put forward by Robert Wess in the previous chapter. To sum up the relationship between methods and modes of being, Rickert writes, "Technique, then, would be equivalent to styles of being with the technological. Techniques and technologies share a transcendent push, with technique emerging as the machining of the human that has sprung a technological attitude" (119). By "modes of being" I refer here to the human and the technological. These Rickert refers to additionally as the "Ding" and the "Non-Ding," heading to his suggestion of the human's awareness of shared activity, and possibly shared being, with technology, or the Überding (118). While the notion of "techniques and technologies" working together can be apprehended simply, the scope of this essay is awe-inspiringly large. It's a wide net that catches Burke, Nietzsche, and Parmenides together, but Rickert has the ethos to manage such an argument. In "The Uses of Compulsion: Recasting Burke's Technological Psychosis in a Comic Frame," Jodie Nicotra seeks a path toward hope in Burke's skepticism toward technology. Nicotra draws attention to Burke's curious shift from the comic corrective focused on acceptance frames, to a tragic perspective focused on rejection frames. I can't help but wonder how this argument will transform in the light of Robert Wess' argument in "Burke's Counter-Nature." The attention Wess pays to Burke's "self-revision" brings to light a fresh perspective on the term "counter-nature" that could lead Nicotra to reconsider Burke's tragic perspective on technology (87). The "affirmative approach" that Nicotra suggests is curious: "How could we use this [Burke's] very idea of compulsion not as a corrective to technology, but as a way to push it through? […] naming and treating technology compulsively will open up certain possibilities for responding and shut down others" (137). The strength of this argument is in Nicotra's diction: her equivocation of Burke's "compulsion" with the modern buzzword "addiction" makes immediately clear the area where we can pivot between multiple positions on our relationship with technology. She demonstrates through examples (dependence upon oil, etc.,) that understanding the deeply rooted relationships between humans and technology can lead to insights into our dependence on technology, which we can use to fulfill the potentials we choose. In other words, the more we know, the fewer limits we have, and the more intelligently we can manage our dependence, or perhaps codependence, as surrounding essays suggest, on technology (138-39). Steven B. Katz and Nathaniel A. Rivers state the issue succinctly: "As with Burke, so with posthumanism. Neither is stable and settled, and so much hinges on the point of departure and the attitude of the journey. How does one move from a given starting point?" (143). These authors identify "seeds of a postambiguity" in The Rhetoric of Religion, and move forward from this point to attempt answering the difficult question posed above. Katz and Rivers hone in on a curious phrase that shows up in Burke's prose: "the ground of the process as a whole" (151, quoting Burke). This is a classic postmodern juncture: what are the grounds of an ambiguous structure? How do we identify the seeds of a being in flux? Before launching an extensive analysis of the film "Fixed," these authors deal with Burke's concept of entelechy with a complexity that leaves my head spinning. While arguing for the retention of Burke's dramatistic method of analysis in the consideration of "new materialisms," Katz and Rivers employ a Burkean move themselves, shifting from emphasis on the term "entelechy" to the term "predestination," and arguing for not only the potentiality in predestination, but also the prima facie quality of that entity: "Entelechy certainly seems to emerge, but it is only ever predestined." As I understand, it is to Burke's own "blurry predestination" that these authors turn in their rereading of his attitude toward our future in a complex technological environment. Despite the complexity and, honestly, the difficulty of the many points in this argument, Katz and Rivers offer eloquent summative phrases at key points in the essay: phrases like, "Posthumanism is…nothing new," "blurry predestination," and "Entelechial black boxes emerge" clarify what otherwise might be arguments too complex for most readers to untangle. Then again, these are complex subjects to tackle, and difficult questions often spur difficult answers. All of this discussion is followed by a lengthy analysis of the film Fixed: The Science/Fiction of Human Enhancement, directed by Regan Brashear. The analysis of this film brings a thoughtful criticism to emerging and imagined technologies in a new world that works with human bodies to blend the human and technological words. The analysis certainly follows well conceptually where the argument by Katz and Rivers leaves off: interviews offer individual accounts of satisfaction and even ongoing joy as a result of technological implements that allow additional mobility to individuals with disabilities, expanding their worlds of possibilities. While the film analysis may fit more comfortably into the greater discussion that this book inhabits as a separate article, it is another example of how the editors in this collection bring a selection of authors with an eclectic array of interests and positions together in one resource. In "Emergent Mattering: Building Rhetorical Ethics," Julie Jung and Kellie Sharp-Hoskins bring the issue of "mattering" to the table in order to discuss "the politics of differential mattering—namely, how and why objects come to matter differently" (163). Like many of the other chapters in this collection, this essay examines borders and oppressive activity in both the environmental and human worlds, and how modern and future technologies come to bear on both. What separates this essay from its surrounding arguments is that it calls for us to pay attention to a future that is already upon us. Not only do we know that our traditional linear considerations of time are becoming irrelevant, but even while we still can see the "future" as what it is, we can, according to Jung and Sharp-Hoskins, find significant issues to address here on our periphery, if we take the time to look for them. These authors demonstrate the presence of these issues through examples concerning mandatory implantation of IUD's and "Toxic Tours," which highlight these problems through a shock tactic that these authors suggest can be utilized to reorient the viewer's perspective dramatically in the moment of viewing the toxic spectacle. For my money, the strength of this essay is its treatment of Burke's master tropes. Jung and Sharp-Hoskins demonstrate the metonymic relationship between a term and its entelechy (171), as well as the relationship between material excess and synecdoche (176). It may work as well in other contexts, as it supports much activity in critical studies and various genres of activism. Nathan Gale and Timothy Richardson return to the theme of competing agencies in "What Are Humans for?" These authors argue that "pure persuasion" is evidently operative in modern data "data-driven technology": "Technological devices, like literary devices, make demands beyond the uses to which they are put by users and authors" (185). Gale and Richardson combine Kevin Kelly's idea of the "technium" and technological agency with Burke's "admittedly pessimistic treatment of Big Technology" to establish what they call "technolostic screens (185)." The holistic in "technolostic" refers to a perspective that takes in all of the humano-technological future in field of endless possibilities. The argument in this essay is similar to that of Rickert's and Wess's, except that Gale and Richardson are quick to point out that in Kelly's theory, the entities of language, humanity, and technology remain individual. One issue in this essay is an apparent double iteration of Kevin Kelly's theory. Gale and Richardson asserts that Kelly's optimism toward what Burke refers to as "Big Technology" does not challenge the delineations that he draws between humanity, technology, and language (191). However, this assertion follows one of the highlights, for me, of the book as a whole: Gale and Richardson quote Kelly stating that language very well should be considered a technology: "…we tend not to include in this category paintings, literature, music, dance, poetry, and the arts in general. But we should. If a thousand lines of letters in UNIX qualifies as a technology (the computer code for a web page), then a thousand lines of letters in English (Hamlet) must qualify as well" (190). Despite this confusion, these authors employ the concept of technolostic screens to make a compelling argument as to how we can apply Burkean theory and keep it alive in a new era that does, and quite frankly has to, embrace technology. Personally, I get lost in reading and rereading the closing argument about looking for love in technology. Beautiful. Casey Boyle and Steven Lemieux's essay A Sustainable Dystopia" closes the collection well by summing up the hopeful spirit of "Futures," and ends the collection building directly on another cornerstone (many Burkes; many cornerstones) of Burke's work. These authors look closely at Burke's "Towards Helhaven: Three Stages of a Vision," identifying it as a dystopia. The strength of this essay is the same as its weakness: it is in the wordplay. Their advent of the term "dystopoi" to orient and manage the human role in the field of emerging technologies upon which the human becomes dependent both smoothly leads the eye and the ear from one term to the next, and insists upon more than validates itself. Then again, this is how Burke achieves much of his brilliant linguistic magic, so the tactic is not without its merit. Regardless of this issue, the ensuing discussion of man's potential for insisting upon resistance to his machines by creating technological screens to work against his writing faculty is both fascinating and . . . well, more fascinating. I feel the need to create a Kafka desk and limit myself to working in some difficult contraption not yet conceived. I sense that, in this way, I would be both challenging myself and the technology. Boyle and Lemieux close the essay with these memorable constructions: "We shall enact a reversal of the ultimate medium, life itself, when we realize that the manageable strife offered by dystopoi offers us equipment for living forever by dying well. In concert with Burke's claim that the human is "rotten with perfection" (Language 16), we propose the posthuman is ripe with imperfections." Beyond its unique point of inquiry and the brilliant set of voices it brings to the table, the strength of this collection is in its coverage of Burke's many complex ideas. Furthermore, the close readings that these authors bring to the conversation touch on thoughtful points in Burke's prose that can easily otherwise be missed, due to his depth of thought and the breadth of his corpus. Not only do these texts enlighten the reader to fine points of Burke's theory and how it can be applied in new ways and new sectors, but we are reminded of the sheer breadth and complexity of his work.